Reta, born September 6, 1929 in Beaver Lodge, AB, passed away at Spring Valley Care Centre on Wednesday, October 24, 2018 at the age of 89. She is survived by sons Neil Krummel of Chicago and Andy Krummel of Kelowna; and grandchildren Jessica, Kristyn, Amanda and Andrea. Reta was blessed with two very happy marriages, but sadly is predeceased by both her first husband, Jack Krummel, and later, her second husband John Wawrynchuk. She is also predeceased by her brother Gordon Cleland of Fort Saint John. 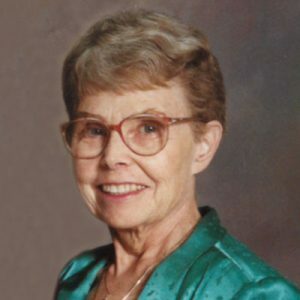 Reta worked as a Registered Nurse at the Harlan Hospital while raising two sons in Avoca, Iowa. She moved to Kelowna in 1976 where she worked at Sutherland Hills Rest Home until she retired. After retirement, Reta and her husband John traveled extensively until John’s passing. Should friends or family so desire, memorial donations in Reta’s name may be made to the Kelowna Gospel Mission, www.kelownagospelmission.ca. Prayers will be recited Wednesday, October 31, 2018 at 7:00 pm at Springfield Funeral Home, 2020 Springfield Road, with a Funeral Service to follow at 11:00 am on Thursday, November 1, 2018 at Faith Lutheran Church, 250 Gibbs Road, West Kelowna, with Pastor Rick Schulz officiating. The prayer service for KRUMMEL, Reta is scheduled for Wednesday, October 31, 2018 at 7:00 pm at located at 2020 Springfield Road, Kelowna, BC . The service for KRUMMEL, Reta is scheduled for Thursday, November 1, 2018 at 11:00 am. Below you will find the map for the service location and the contact information should you have any questions.